Get to know experts in the Canadian franchising community! Season 1 of the Franchise Canada Chats Podcast features Canadian franchisors, franchisees, and leaders in the industry. Join us once a week as we sit down with members of the Canadian Franchise Association (CFA) to discuss their journey into franchising, the challenges and successes they’ve faced as small business owners, and more! 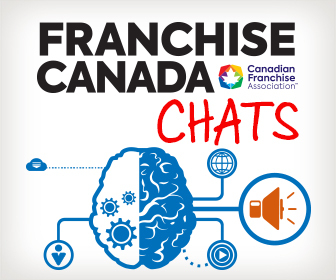 Check back every Monday for the latest episode or subscribe to the Franchise Canada Chats Podcast on iTunes,Spotify,SoundCloud,Stitcher Radio, Google Play Music and/or Spreaker. *Please excuse the sound quality at times during this interview. The information is so valuable it’s worth sticking with it!